I think the Galaxy nails prompt would be right up there with Rainbow nail for one of my favourite prompts from the 31 Day Challenge. I just love that there are so many ways you can do galaxy nails that they will never look the same twice. 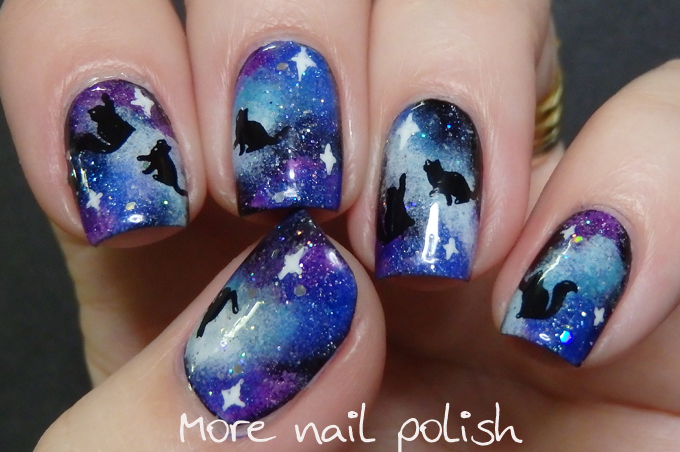 A few months ago I saw a few girls on instagram doing Cats in space galaxy nails. I think it started with this excellent mani by Very Emily. 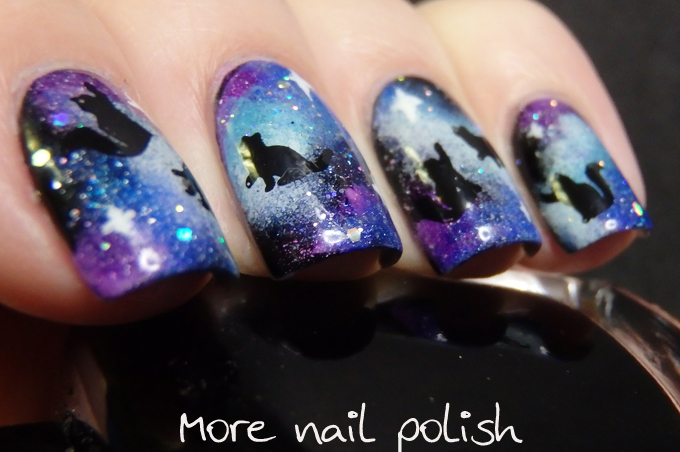 Not having any cat water decals, I decided to stamp on my cats in space. 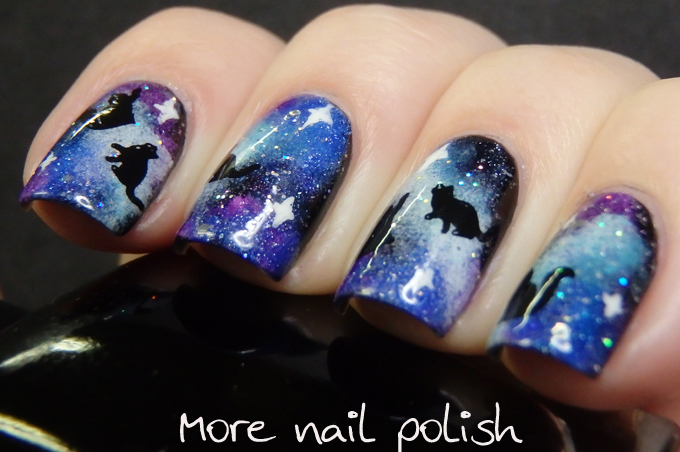 I used the cats from DRK-A stamping plate. I love how the colours came out in this galaxy mani too. I started with a blak base and then sponged on some white to make the blue and purple stand out. I used Picture Polish Cosmos, Shy Violet and Instinct, and topped it with Glitter ball, which has just the perfect ratio and size of holo silver glitters for a galaxy mani. 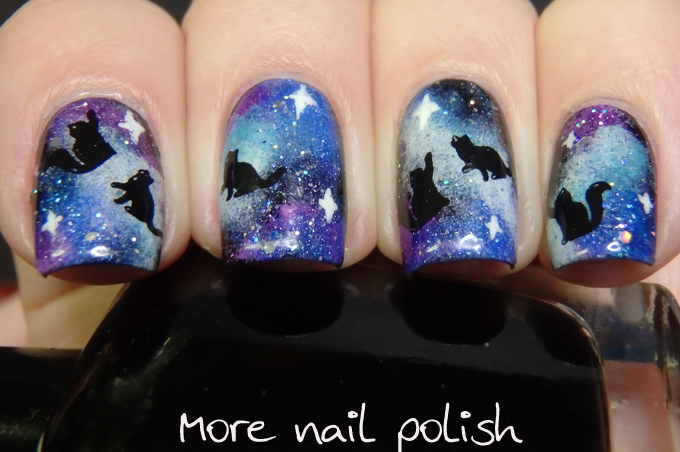 Stars are free handed in white and cats in Mundo de Unas Black. My galaxy nails from 2013! Favorite mani on anyone I have ever seen! Of course I am a cat person. Perfection! I couldn't love these felines from another galaxy more!